Park Slope's only direct cheese farmer to store operation, selling over 25 different traditionally made, European cave-aged sheep and cow artisan cheeses produced locally in New Jersey. Fresh tubs of butter, yogurt, and fruit spreads and preserves from local growers, including over 150 artisanal products such as local rooftop honey, tasty granola mixes and chocolates. Straight from their NJ dairy farm shop are snugly sheep skins and merino wool blankets. Complimentary gift wrap available during special holidays. Welcom to chain your bike to the parking sign in front of the shop. Sunday: 10:00 p.m. To 7:00. p.m.
Live web cam feed from farm to the shop. Over 20 different aged cheeses produced on their own farm; wool blankets; Ariston premium extra virgin olive oil and 12 year aged balsamic vinaigrette (refillable); local specialty honeys and spreads; daily sandwiches, some hard salamis and crackers. Valley Shepherd Creamery is Park Slope's only farm-owned cheese shop, selling single origin Pyrenees style cave-aged artisanal cheeses. Adopting Europe's old-world techniques, owners Eran Wajswol and Debra Van Sickle have recreated a European sheep farm and creamery in Long Valley, N.J.
At any given time, the Park Slope cheese shop sells a variety of 20 different cheeses, with over 25 different cheeses seasonally produced on the farm. All cheeses are raw and cave-aged, hand-made without hormones or antibiotics, made from sheep, cow and goats milk, and produced under the "Oldwick Shepherd" label named after the charming local village. Sample before buying featured cheeses and Ariston's refillable 100% extra virgin cold pressed olive oil from Greece, and 12 year aged Italian balsamic vinegar — recycle and save $2 with each refill. The shop offers a variety of specialty honeys and spreads from local farms along with crackers to eat with your cheese. A small refrigerated section includes farm-fresh tubs of butter - a blend made from sheep and cow cream, 100% sheep milk yogurt and a small selection of hard salamis and Casalingo sausages. For local businesses, pre-made lunch time sandwiches are prepared daily for take-out. During the cooler months, the shop sells warm fluffy sheep skins and soft 100% virgin wool blankets woven from the farm's sheep, sheered in April. Sewn onto each blanket is a silk label with an individual serial number bearing the Valley Shepherd Creamery name. Educational and seasonal creamery tours and events are offered throughout the year. Events include wine and cheese tastings, dinners and cheese making classes. Bring a sandwich and have lunch at the farm. Special dates are set for transportation from New York City to the creamery. Check Valley Shepherd Creamery's website for schedules, fees and farmers market dates. From the sidewalk, it looks like just another cheese shop — look again. The Valley Shepherd Creamery's Park Slope shop is only one facet of a bigger picture. Since 1986, the shop owners Eran Wajswol and his wife, Debra Van Sickle, have been fulfilling their vision to create a self-sustaining sheep dairy, geared toward educating the community in the process of sheep management and passionate cheese making. Valley Shepherd Creamery is New Jersey's only creamery, making over 25 different raw cave-aged artisanal cheeses. All cheeses are made on their sustainable 120 acre family farm from their own sheep's milk using traditional European methods. In parallel with learning sheep herding on their own farm in Long Valley, New Jersey, the couple devoted five years of research traveling to Europe's remote hidden sheep creameries. After discovering the many traditional cheese making techniques, the dairy owners settled on the Dutch Friesian milk sheep and decided to start production of a Pyrenees style cave aged cheese. Valley Shepherd Creamery gives thanks to the many shepherds on the mountain tops and the valleys of Spain, France, Italy, Netherlands and Belgium who had shared their expertise in classic cheese making. Today, the family farm is managed with traditional farming techniques, herding more than 700 heads of happy sheep, goats and cows. Sheep are milked using the creamery's state-of-the art rotary milking parlor and revolving feeding troughs. 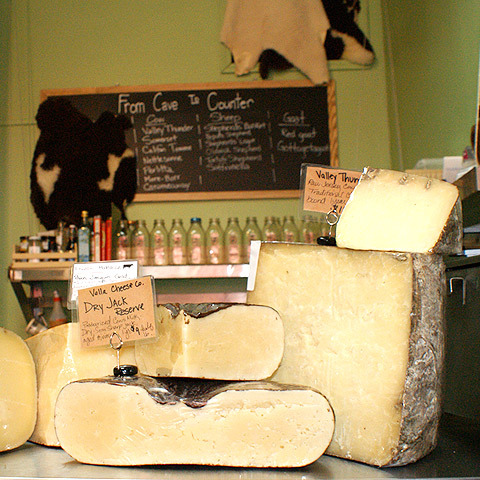 Fresh farm-made dairy and cheeses are hormone and antibiotic free, aged to perfection in the farm's own hillside cave. You will find a full variety of their aged cheese types sold under the "Oldwick Shepherd" label, named after the charming village where the creamery is located. The 20 foot underground cave is divided into several rooms where the cheese is ripened and cared for in a traditional aging atmosphere on ash wood shelves for 3-12 months. The cave and its viewing gallery is part of Valley Shepherd Creamery's Fall Harvest tour, offered September through December. The farm and creamery are open to the public and schools for educational tours and seasonal events. Learn about spring lambing or arrive in the fall for their Fall Harvest tour where guests visit the only rotating milking parlor in the United States and take a hay ride to the cheese aging cave. Indulge in wine & cheese pairing events and dinners hosted by local wine experts or make your own cheese wheel in a cheese making class. Soon, pick-up locations from New York City to the farm will be available. The farm also includes a pet pasture, home to miniature ponies, baby alpacas, angora goats, hens, chicks and even some retired sheep. The farm's Sheep Shoppe is where visitors may purchase beautiful European imported sheep and farm related items and, of course, sample the cheeses before buying. The Sheep Shoppe also sells fresh yogurt, butter, hanks of hand-spun wool, sheepskins and soft queen-size virgin wool blankets made from April's sheered sheep. In late October, lean and delicate Grass-fed lamb meat is available at the Sheep Shoppe. A full or half lamb may be reserved by pre-ordering using their lamb reservation order form and faxing it back to them. EWE-POO© fertilizer is sold in 40 pound bags, available exclusively at the Sheep Shoppe. EWE-POO© is an organic fertilizer composted on the farm, made from farm animal bedding and manure using a state-of-the-art computerized controlled system that enables them to compost up to 30 tons in half the time of the normal composting method. Visit Valley Shepherd Creamery's website for weekly farmers market locations in New York City and New Jersey where several cheeses are cut to order. Tours, events, cheeses and shoppe items can be purchased on their website. Because they care, they only ship cheeses Monday through Wednesday so no cheese sits in a warehouse somewhere over the weekend. If you are unable to make it to the farm, Valley Shepherd Creamery's Park Slope shop carries the same farm-made cheeses, butter tubs and 100% sheep milk yogurts. In addition there is Ariston's refillable 100% extra virgin cold pressed olive oil from Greece, and 12 year aged Italian balsamic vinegar, it too like the cheeses, may be sampled before buying — recycle and save $2 when refilling your original bottle. The soft Virgin wool blankets and sheep skins are also available in the SoHo shop, along with crackers and Casalingo sausages to have with your cheeses. There are a number of hostess gifts, specialty honeys, local Vermont preserves and fruit spreads made by Sidehill Farm and Vermont Harvest, as well as interesting imported specialty items discovered on the owner's travels. Valley Shepherd Creamery offers a unique opportunity to experience the taste of old-world artisanal cheeses without having to travel far. A couple of the fresh lamb sausages produced at the farm are Apple Maple and Tomatoe Basil. Come spring time there will be fresh buttermilk and lots of ricotta cheese. Fresh ravioli, manicotti, and gnocchi in seasonal varieties made with their farm fresh cheeses. Seasonally, you will find the refrigerators stocked with lots of fresh buttermilk & Ricotta cheese in the bucket. Fresh breads from Orwashers, Grandaisy and Sullivan Street bakeries are delivered daily between 4:00 a.m. & 5:00 a.m. Baked goods by "Ovenly" are baked in small batches and are vegan friendly - delivered on Fridays. Fresh Gluten free brownies, and special flavors are made for special holidays. Small Batch Cocktail Bitters and Culinary Extracts by Bittermens are also sold.